ConceptDraw DIAGRAM is a software for making EPC diagrams that allows managers visually present business process models for making decisions for business processes improvement. Our software work on both platforms Windows and Mac OS X. Shapes from EPC notation designed especially for a very effective visual diagramming in ConceptDraw DIAGRAM to facilitate the process of depicting business processes. Pic.1 Design elements for EPC diagrams. Stencil library EPC Diagram Shapes from Event-driven Process Chain Diagrams solution provides 23 vector design elements for drawing event-driven process chain diagrams. Use design elements from the EPC Diagram Shapes library for drawing your EPC diagrams to plan resources and improve business processes. An event-driven process chain diagram is a flowchart used in business process analysis. It evolved from Architecture of Integrated Information Systems (ARIS) and utilised in the business process improvement and analysis. It is also used to facilitate enterprise resource planning. An EPC diagram is a complex flowchart that shows different business processes through various workflows. The workflows are seen as functions and events that are connected by different teams or people, as well as tasks that allow business processes to be executed. ConceptDraw DIAGRAM v12 is a software for making EPC diagrams that allows managers visually present business process models for making decisions for business. The Event-driven Process Chain ( EPC ) Diagrams allows users present business process models in terms of work flows. The EPC diagram can show various ways for improvement throughout an organisation. 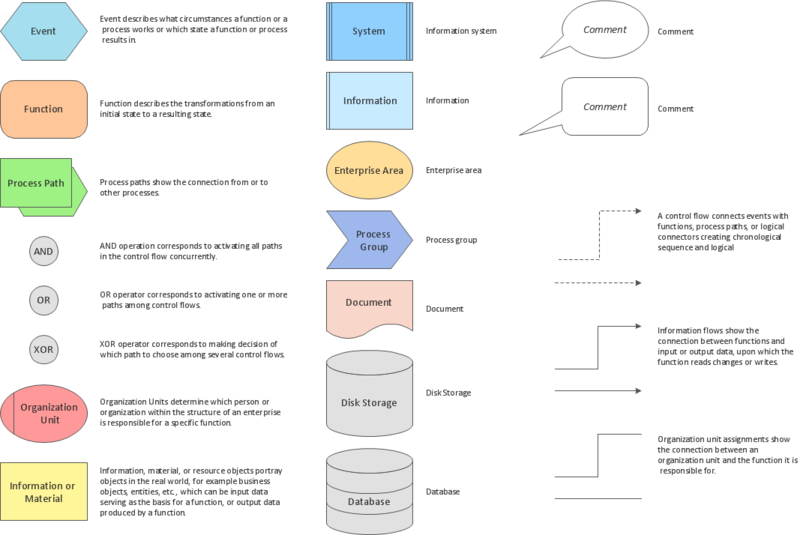 Event-Driven Process Chain Diagrams is using for improvement throughout an organisation. ConceptDraw DIAGRAM v12 - software that reduces the time needed to create a EPC diagrams.